A Maryland high school’s music department is looking for replacing instruments lost in a bus fire. Students from Northwestern High School in Hyattsville were returning from New York Sunday after attending a Broadway clinic with the cast and musicians from the musical “Wicked” when the bus caught fire. "You could tell when they got about 5 feet away from the bus, they started to move a lot quicker because they could see the flames," Northwestern High Visual and Performing Arts Department Director Anthony Townes said. The students safely escaped but some of their personal items and instruments were lost in the fire, including violins, flutes and clarinets. "The first thing I was thinking of was belongings that were still on the bus," student Elijah Martin said. "Much of the stuff that was on there was very expensive." 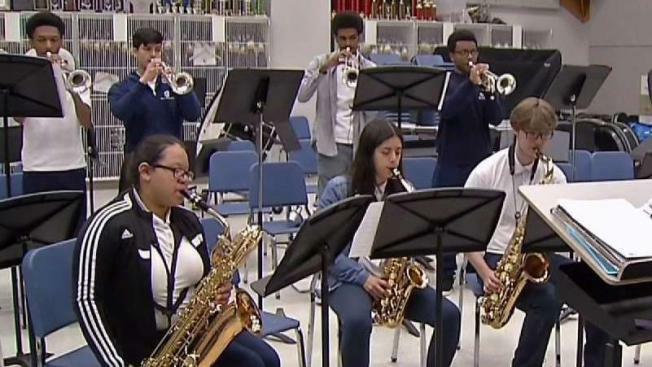 Students got perfect scores during a Maryland State Assessment Festival performance Monday using instruments loaned to them by the Washington Music Center and the Baltimore Brass, but those instruments had to be returned, Townes said. Many of the students hope to find careers in music. "I feel like when we play jazz it's just more emotion, and you're free to explore and play what you feel," student Sylvia Garcia said. "You're not confined to playing inside of a box." Anyone interested in donating instruments or money should contact the school at 7000 Adelphi Road, Hyattsville, MD 20782 or by calling 301-985-1820 or emailing the principal.